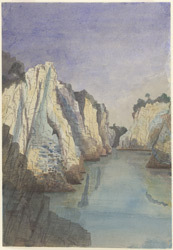 Water-colour drawing by Stanley Leighton of the Marble Rocks at Jabalpur, dated 1 January 1869. Inscribed on front in pencil: 'Jubbulpore. The Marble Rocks. Fri 1st Jan, 1868.' (1868 is a slip for 1869). The Marble Rocks, situated 21 kilometers from Jabalpur, rise to a height of 100 feet on either side of the Narmada river. The magnesium and limestone gorge offers a spectacular sight when the sunlight reflects on the rocks which seem to be made of silver. A little distance away the tranquil water of the river becames turbulent as it plunges in a powerful waterfall known as Dhuandhar.